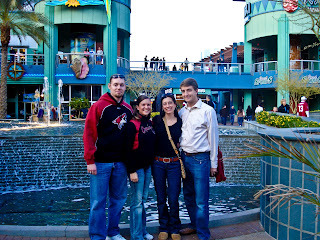 Back in January, one of my old friends from grade school, Krissy, and her boyfriend Mike invited Max and me to our first Phoenix hockey game! 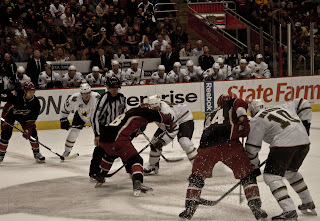 The Coyotes played the New York Islanders and were behind most of the game but tied it up in the last period resulting in overtime and then a five round shoot-out! They definitely put up a good fight but lost in the end. Thank you Mike and Krissy! Our seats for this game were just three rows up from the ice (note the nice photo above!). I was enjoying this great view when, just two minutes in, the first player was body-slammed into the glass panel right in front of us. I don't know if it was the sound or the surprise, but I definitely let out a scream that was luckily somewhat muffled by the pounding on the glass. Max assured me that really, it was okay that the glass was bending like it was and that that "give" was making it safer for us. I was still skeptical as I am not used to glass folding or bending at all, especially not toward me. 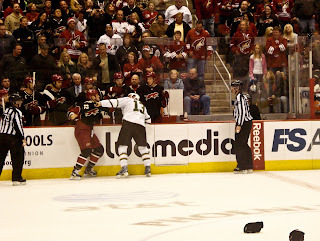 Just a couple more minutes into the game, Petr Prucha, one of the Coyotes players, was slammed into a panel just to our right and was instantly knocked out. He was carried off the ice in a stretcher (very scary but the current reports say he was released from the hospital okay). Max said that serious injuries like that cause lots of tension between the teams, and true to his prediction two big fist fights followed in the first period alone! Gloves and helmets were thrown aside and I spent a good amount of time with my head in Max's shoulder only half peeking out. What was just crazy for me (besides the referees just standing and letting it happen) was the cheering crowd. One man said it was an "old school" game. 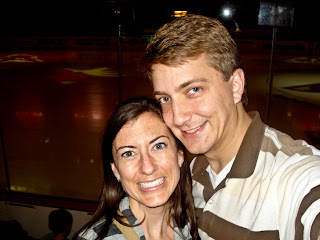 Alas, the game was a shutout with the Stars winning 3-0 (my husband I know was secretly glad). Smiles from the ice!